One of the most popular Bitcoin poker rooms for US players, America’s Cardroom, has recently revealed that it is now officially accepting over 60 cryptocurrencies on its platform. The change, which was first announced near the end of September on the America’s Cardroom website, has already been implemented, giving any new and existing user a chance to deposit and wager in any cryptocurrency they might be holding. Active since 2001, America’s Cardroom (ACR) slowly grew to becoming one of the most popular poker networks for U.S. players online. Thanks to the acquisition of its subsidiary, the WPN (Winning Poker Network), which was an early adopter of Bitcoin since 2014, ACR become one of the key faces in online poker but also BTC gambling after officially adopting Bitcoin in 2015. And now, the site has set on a new course to become a leader in cryptocurrency gambling, accepting over 60 forms of cryptocurrencies on its platform. According to the official update, ACR is now allowing its players to deposit in whatever cryptocurrency they like while withdrawals will be subsequently made possible during the upcoming weeks. 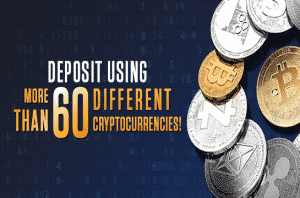 After you make a deposit, the site will simply convert your cryptocurrency to an USD balance that you can use to buy your way in to various poker tournaments on the platform. According to an ACR spokesperson, the poker site has received very positive feedback after implementing Bitcoin thanks to the relatively small fees but also the fast withdrawal processing time-frame, especially when compared to fiat money. Thus, it was a logical step for ACR to further expand their payment options to include other available cryptocurrencies as well. According to the spokesperson, ACR is taking a neutral stance on which is the best cryptocurrency to use, saying that since they’re no “cryptocurrency experts” they can’t really back up one coin over another. The site also warns users about taking caution when using cryptocurrency sites by saying that “it’s best to be careful out there”, a warning that was most probably prompted by the DDoS attack they’ve recovered from recently. One of the reasons for ACR’s high traffic volume is that the site regularly features its own original set of Poker tournaments. Starting with a weekly Sit and Crush leaderboard that comes with no extra fees and moving through the week with The Cage – a Wednesday “go-big or go bust” game- and the Sunday Specials, there are plenty of opportunities to amass a big stack of crypto coins at America’s Cardroom, especially if you know your game well. In fact, you don’t even have to look for the weekly promos to make some money here. Namely, as a new player at the platform, ACR will give you 20 days of free cash after you’ve made your first deposit for a total of up to $50 in tournament cash, apart from offering you the standard welcome bonus. Furthermore, as a new depositor you will also be able to enjoy 4 free-roll tournaments that are only open to new players. If you’re interested in claiming any of the promos, or just browsing through other available offers on the site, you can visit America’s Cardroom through this link here.